The rich were sent up again in WORLD’S WEALTHIEST MAN CELEBRATES 94TH BIRTHDAY, which featured John D. Rockefeller so displeased with his birthday gift — Radio City Musical Hall — that he attacked his son with a cake knife. Then Marilyn Miller got a big solo spot with THE FUNNIES, which she sang before a backdrop of comic strips and a chorus of cartoon characters. The next sketch, GREEN PASTURES STARTS THIRD ROAD SEASON, featured Ethel Waters singing “To Be Or Not To Be,” as the bitter wife of her egotistical actor husband currently starring in The Green Pastures, the acclaimed 1930 play that featured Biblical stories told from the point-of-view of young black children. The first act closed with the ROTOGRAVURE SECTION, in which an image of the 1883 Easter Sunday on Fifth Avenue came to life in the charming “Easter Parade,” which was adapted from one of Berlin’s old trunk songs, and would become popular by Astaire and Garland as the title tune in MGM’s 1948 film of the same name. The next headline lambasted two more popular figures — pacifist Mahatma Gandhi and evangelist Aimee Semple McPherson — as the latter tried to get the former to end his hunger strike and join her act in GHANDI GOES ON NEW HUNGER STRIKE. A number for the dancers followed in REVOLT IN CUBA. But the next headline, NOEL COWARD, NOTED PLAYWRIGHT, RETURNS TO ENGLAND, brought more laughs, as the four stars played hotel attendants forced to handle the eccentric playwright. SOCIETY WEDDING OF THE SEASON followed, with bridesmaids and ushers preparing for the most important wedding of the season, as the groom tries to wake up his sleepy bride for “Our Wedding Day.” Ethel Waters returned as Josephine Baker for the next headline, JOSEPHINE BAKER STILL THE RAGE OF PARIS. In it, she sang, “Harlem On my Mind,” in which the international star longs for her old neighborhood. With some of my favorite Berlin lyrics, the number was another smash success for Waters. The following headline was PRINCE OF WALES RUMORED ENGAGED, in which Broderick as Queen Mary interrogated the Prince with her husband, King George V, after the pair had learned about their son’s engagement from Walter Winchell’s column. 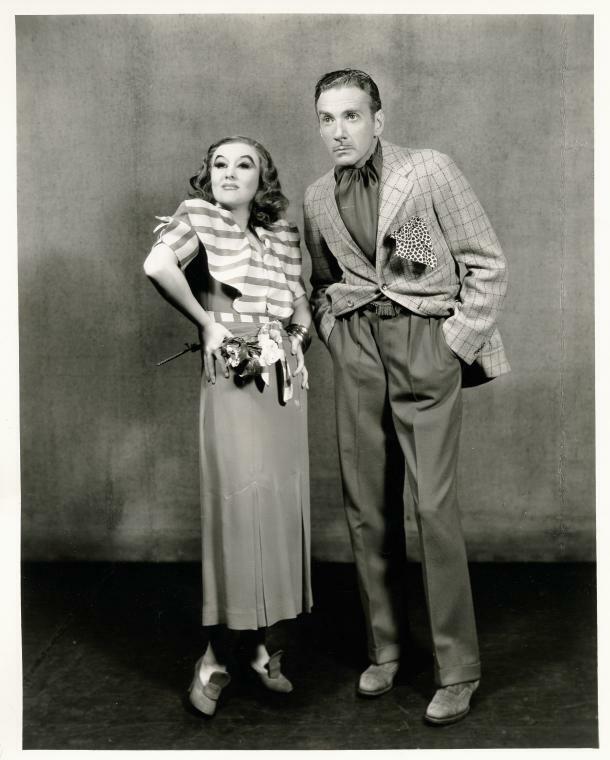 The BROADWAY GOSSIP COLUMN followed with Clifton Webb as a gossip columnist singing “Through A Keyhole.” (This number was cut during the Broadway run.) The last headline was SUPREME COURT HANDS DOWN IMPORTANT DECISION, in which the Supreme Court ordered that musicals can no longer end with reprises of their hit songs, so Webb and Miller are forced to sing a new one: “Not For All The Rice In China.” Backed by the ensemble, As Thousands Cheer ended on a cheerful note, but it took Berlin and Hart much pains to get there; the original finale was “Skate With Me,” with the entire cast as Park Avenue folk on roller skates, but it proved disastrous on a non-linoleum stage. The show was revised and presented in London as Stop Press (1935), with a handful of Schwartz-Dietz numbers supplementing the score. 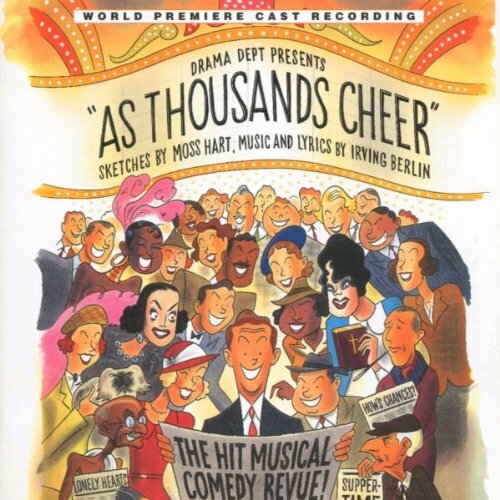 Since then, As Thousands Cheer has been presented a few times in concert, and was awarded a cast album after the 1998 Off-Broadway revival. But as that production lacked orchestrations, a full recording of the score has yet to be produced. As usual, the score for this forgotten gem is excellent and varied. Berlin’s music would need no supplementing or revising for a 2013 revival. But there are two major obstacles preventing As Thousands Cheer from being an easy show to remount: the stars and the sketches. The sketches are incredibly topical, as the nature of the show requires them. And though I think the book is excellent in its representation of a slice of life through 1933’s headlines, an insert in the program with notes about Barbara Hutton and Aimee Semple McPherson would be essential. And how about those stars? 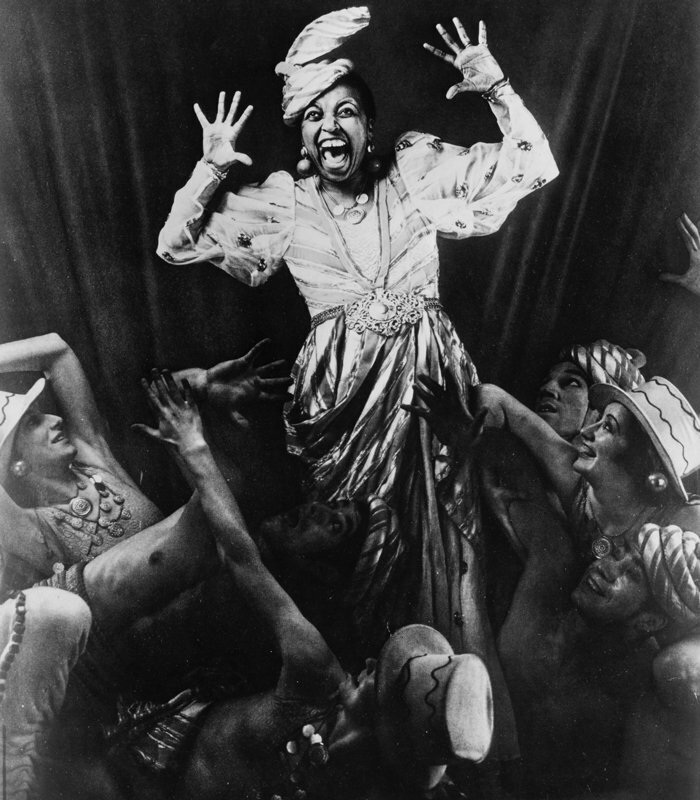 Though I’ve discussed Ethel Waters and her excellent numbers, the other stars, Miller, Webb, and Broderick were on par — each unique and dynamic. Surely they brought in audiences of 1933; contemporary stars would need to do the same today. But could anyone sell a “Supper Time” as honestly as Ethel, and not oversell it? Does anyone have the charm to play “The Funnies” like beautiful Marilyn Miller? 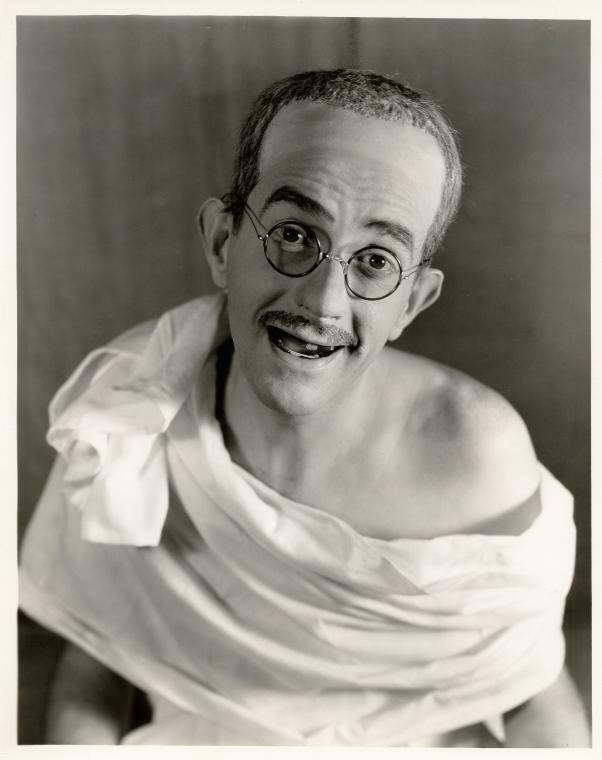 And could anyone today possibly know how to play Mahatma Gandhi and Aimee Semple McPherson? I’m willing to bet there are some that could, but they may not be stars. 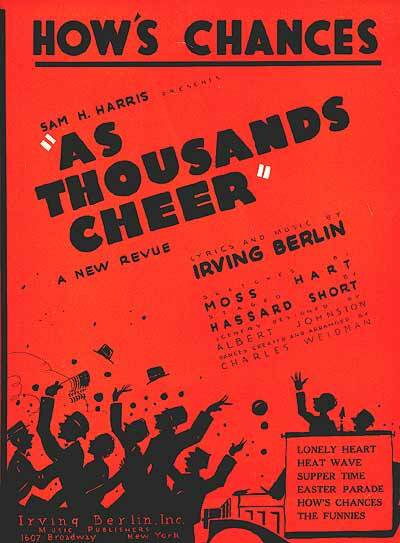 In fact, I think As Thousands Cheer would be a hard show to sell to non-theatre buffs. And not just to uninformed audiences, but to uninformed stars as well. They’d have to be attracted to the music — which is a cut about the scores of 2013. I think, though the sketches could be tinkered with to make them more accessible to modern audiences, re-writing them totally would not be a good idea — the difference between the authentic 1933 sketches and remodeled 2013 ones would be too apparent. Either the producers commit to mounting the show close to how it was presented in 1933, or write completely new sketches around headlines from 2013. (But then, why even bother to use the Irving Berlin score?) As Thousands Cheer is perhaps the most period of period pieces. Witty and topical, it would only work if presented by people interested in presenting it as a 1933 musical. But that’s precisely why this show could and should be seen again: it’s 1933 Broadway at its funniest, most musical, and most enjoyable. All that and Irving Berlin too? That’s more than enough for me! Come back next Monday for a 1934 show that’s Ripe For Revival! And tune in tomorrow for the best Our Miss Brooks episodes from Seasons Two and Three!